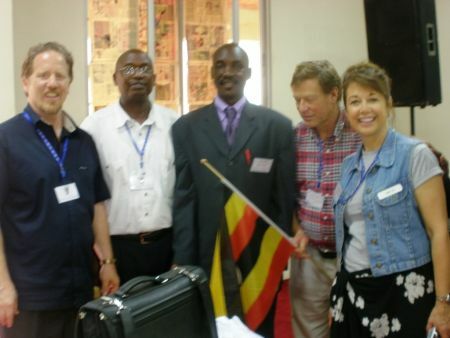 Sandy Hudson from Missouri was part of the team who traveled from USA to Africa to minister at the Regional Gatherings, which included Dennis Capra, Nate Tanner and Jim Whiting. 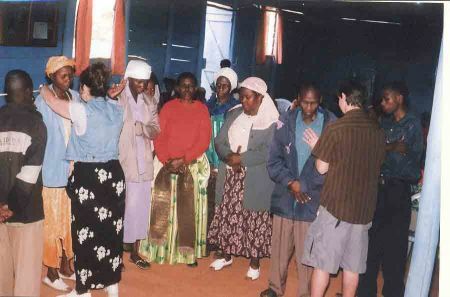 Sandy was instrumental in helping with the medical clinics, teaching and praying with attendees. Here is a report from her. 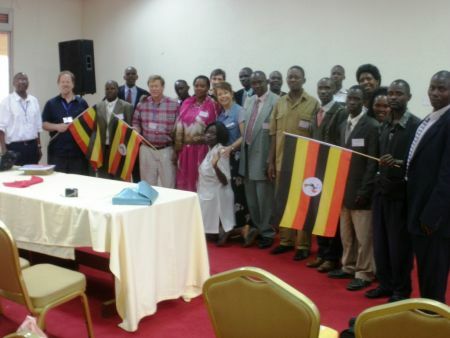 The Conference in Uganda was wonderful with approximately 60 FMIN Partners attending and others who were interested. Dennis Capra and Bill Kilel did most of the teaching, shaking up the pastors' perception of religion and helping them to grasp the incredible grace message that we preach. True religion really is all of us taking care and loving each other, not the traditions and power struggles that most experience. I had a chance to share as well, and spoke some on jealousy and how it changes the focus from recognizing our generous Father and turns to something limiting and ugly. We then had two days of clinic in a nearby neighborhood. What wonderful results! We saw approximately 300 people come through the clinic, with Jim Whiting heading up the clinical aspect, a dear Partner and nurse Florence Busiingye assisting him. I did several sessions on sanitation, nutrition, hygiene information discussions, and then Nate Tanner and I presented the gospel and prayed with over 120 to be saved! Many of those were Muslim, as this was a predominately Muslim neighborhood. We also saw many healings. At the youth service on Friday night, about 10 people received the baptism in the Holy Spirit. It was an awesome time!!!!! Then in Kenya, we repeated the conference schedule. We had 2 clinic days at an orphanage outside of Nakuru, called the Kerry Children's Ministry. FMIN Partner William Othieno headed up this aspect of the trip. He runs a orphanage and day school for 90 children. We saw approximately 500 people come through the clinic in those 2 days. The Lord orchestrated the whole event. 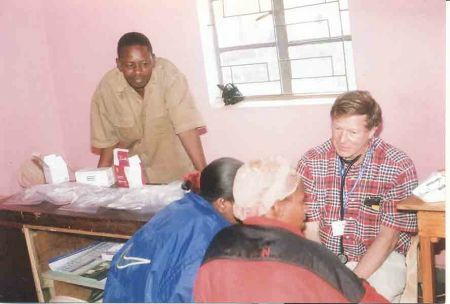 The medical director of Nakuru (with whom we have worked previously) provided us with 15 staff people who ran this outreach clinic performing AIDs testing and counseling, clinician services, pharmacists and medications, family planning counseling, vaccinations and nutrition counseling. Many people were helped beyond our expectations! Jim, Nate, and I marveled at how easy the clinic ran this time with all this wonderful help! We were free to do gospel presentations, children's ministry, sanitation and hygiene talks, healing, salvation, and just loving on all who came! We prayed with approximately 100 to receive Jesus as Saviour and again saw many people healed and touched by the Holy Spirit. We also focused prayer for family and financial situations! We are so appreciative for the support of all the FMIN Partners and friends! None of this would have been possible without you! That was nice. Thank you Sandy and all of your team. By the right time God will reward you. 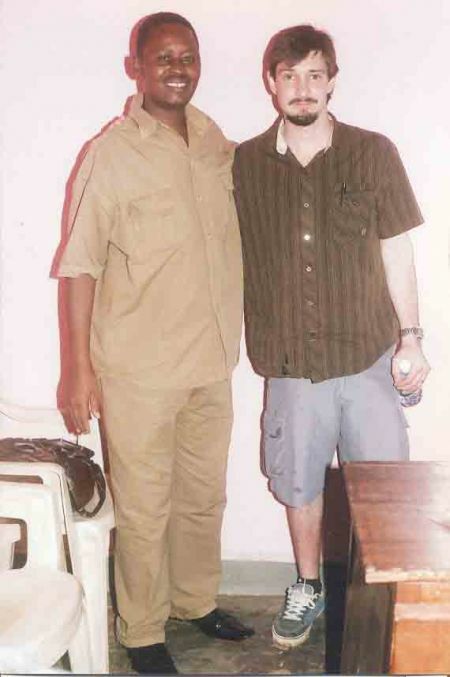 I hope also that one time I will see you in Kigali Rwanda. You captured all the amazing details of your team. Thanks for sharing! Thank you Sandy for a great report and pictures. My heart continues to be so full and in awe of what our Lord has done. Thank you Jesus! Now that I've seen the report I know I missed out by not going with you this time! God-willing I won't miss out again!